Interested in going solar but want to get an idea of how much it will cost you before you choose to do it? You’re in luck, the US Department of Energy and companies have worked together to develop numerous solar cost-estimating tools to help you understand how much a solar array should cost you. Having that knowledge ready and available when you talk to solar installers helps you better understand the pros and cons of financing solar options and can help you save thousands with highly-qualified and rated solar installers. Solar cost-estimators, often called solar calculators, perform a number of functions designed to help home and business owners go solar, replacing all or part of their electric bill with power produced by their own solar power system. The most comprehensive calculators use your address and geodata—including longitude and latitude, weather and more—as well as information about incentives like tax credits and net-metering, as well as and data from installers and utilities to deliver a basic cost-estimate for the amount of solar panels your building needs and estimates the cost and the benefits of a solar system for your building. To get the most relevant data for estimating the costs and benefits of a solar rooftop for your location, you’ll have to input your address into the calculator and your electric provider as well as your electricity bill costs. But doing so doesn’t mean you’ll be bugged by installers coming to your door. While many companies have developed their tools independently—Google’s Project Sunroof included—only a few, like those developed by Solar-Estimate.org and EnergySage are supported by the US Department of Energy (DOE). Solar-Estimate.org's tools and comprehensive calculator were originally developed with DOE and it continues to expand and grow to meet the needs of homeowners, businesses and other commercial users, like nonprofits and governments. The DOE’s National Renewable Energy Laboratory also offers a solar calculator tool called the PVWatts Calculator. Each tool has its benefits and limitations. The tools at Solar-Estimate.org are the easiest to use and the most comprehensive of the major independent solar calculators. Among other unique calculations it accounts for, it’s the only solar calculator in the US to include local incentives in its calculations, distinction that help you realize even more potential solar savings. By the time you enter your ZIP code the calculator already uses local information to deliver the average local costs per watt of a solar system based on various financing options, leases, cash purchases and PPAs, as well as the average savings experienced by solar users in the area. The tool also aggregates data to provide users with a list of local utilities to choose from, in case you have multiple choices. This is important because different utilities offer different incentives. From that point the calculator begins directing you through a series of simple steps, including what type of roofing material your home has, whether or not your home is shaded, the angle of your roof, and whether you plan on installing solar on the ground or on the roof. Questions that will help the calculator and installers understand any extra costs that could be associated with your array and how much power your system can produce. 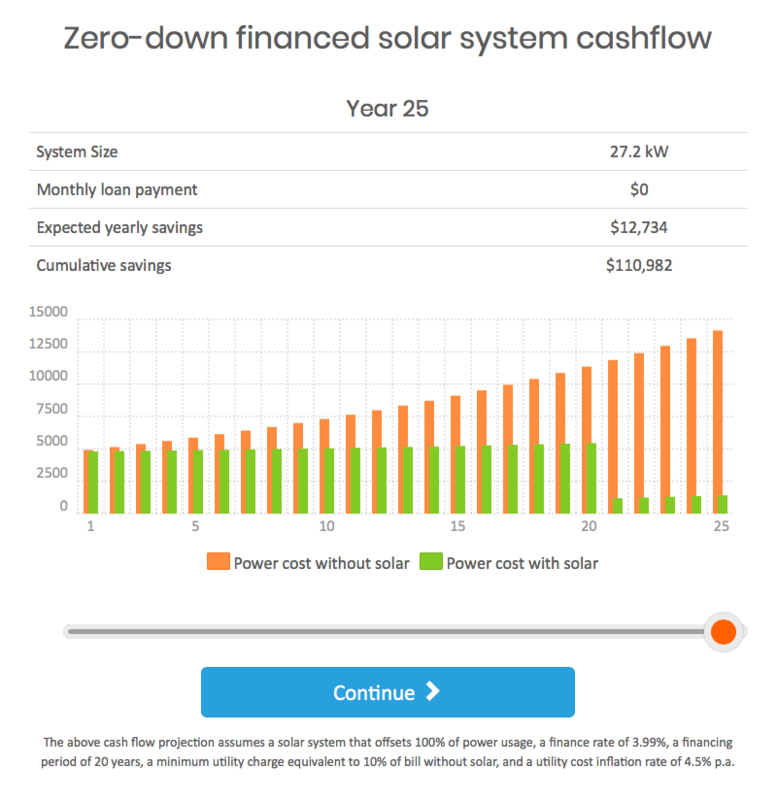 Solar-Estimate.org’s calculator offers you a choice of financing options to look into and generates estimates of how much a system will cost you based on each financing type if you choose to see all. For outright purchases and loans the estimator shows you the cost per watt of solar power and and if you opt for a no down-payment lease or PPA it shows you how much the power from the solar system should cost you on a kilowatt per hour basis, which includes an expected price escalator of 2.5 percent a year. The escalator is included in most lease or PPA agreements to match the expected increase in costs associated with expected rising electricity prices. 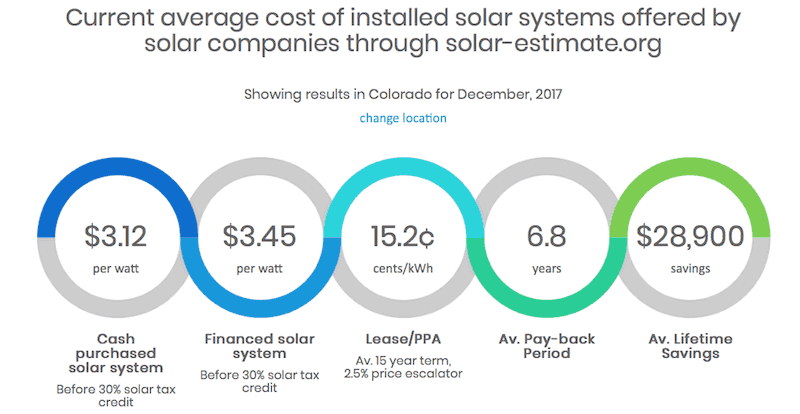 The tools at Solar-Estimate.org also include an average payback period for going solar compared to using electricity from the electric grid. Like the tools offered by Google’s Project Sunroof, Solar-Estimate.org also offers information about the environmental impact of going solar, including carbon dioxide reductions. The Solar-Estimate.org tools automatically assume that you want to offset 100 percent of your electric use with solar power. However, users can also change that, either by lowering your estimated monthly electric bill in the solar calculator process or by using individual tools available on the site’s Solar Calculator page. The Solar-Estimate.org site connects you with up to 4 solar local installers as well, each of which will generate custom quotes for you and have agreed to use Solar-Estimate.org's estimate in their quote. The installers can also offer additional services, including energy storage systems, energy efficiency options, electric vehicle chargers and more. Since Solar-Estimate.org works hand-in-hand with its sister site, SolarReviews.com it has access to thousands of installers across the US—far, far more than the roughly 500 EnergySage said it works with—and you can easily check out the rankings and customer-based reviews of each of the installers who offer you a quote to ensure you’re choosing the best installer for you. While EnergySage’s Solar Calculator performs the basic functions of a solar calculator it actually relies on solar installers to offer detailed information about the solar systems they could install on your home. 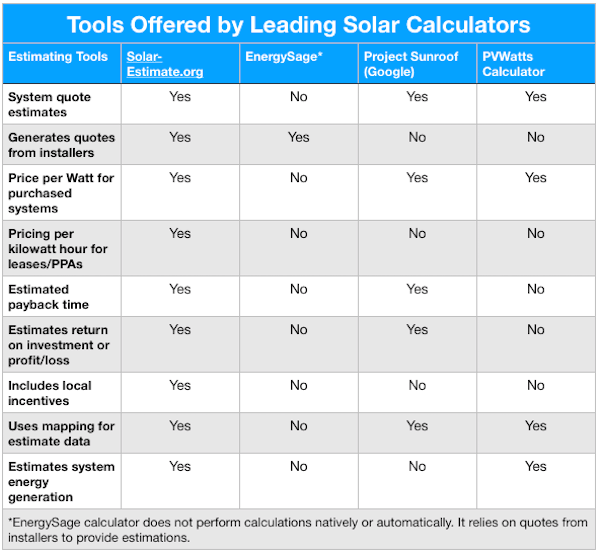 The tool itself does not offer users specifics on a recommended solar system size, estimated costs and benefits of a system, the savings a solar system should generate over its lifetime and other essential information. Nor does the tool let users customize the size of the system they want based on various preferences like how much of their electric bill they want to offset or how many kilowatts of solar panels users want on their home or business. The EnergySage Solar does connect users with numerous quotes from installers. They submit bids based on their estimations of the size of the solar system they deem appropriate for the property based on the information provided to Energy Sage. EnergySage offers an initial, limited estimate based on local installations, but the estimates from installers take a little time. Google’s Project Sunroof uses numerous tools to generate an estimate of how much beneficial solar power can be installed on a roof. Using its mapping tools it estimates weather patterns, local electric prices and estimated incentives as well as the pitch of a roof, potential shading issues and position of the roof. The tools don’t cover the entire US but cover most metropolitan areas. Unlike EnergySage’s calculator Project SunRoof allows users to estimate their electric bill using a slider, where EnergySage requests users either input their energy bill account information or directs them to average their bill over time. Based on all the information input into Project Sunroof, the tool calculates a recommended solar system installation size and offers other useful estimation information. These include its estimates for the up-front costs for a solar system, whether the property owner chooses to purchase the system outright, purchase it with a solar loan or finance it through a power-purchase agreement (PPA) or solar lease. The tool also estimates a payback period for the system it proposes as well as explains any anticipated savings, anticipated incentives, estimated utility payments during the expected lifetime of the solar array and any savings the system should produce during its useful lifetime. The tool also suggests what the environmental impact of going solar would be compared using grid-powered electric. Project Sunroof does not provide users with estimates from solar installers or screen solar installers based on their reviews or performance. It does offer a link to local installers based on the information users input into the tool. The tool developed by NREL is likely the most flexible in terms of input. It allows users to input a lot of information, choosing the closest weather station and solar system size to the solar module and array type—including roof, fixed-ground mounted or tracking. It allows users to input anticipated system losses, anticipated array (or roof) tilt and azimuth angle—the angle clockwise from true north the installation will face. However, because PVWatts allows users to input so much information and uses terms that the layman isn’t familiar with, the tool is likely the most confusing of the solar calculators. The calculator makes assumptions about the local average cost of electricity. In making its final calculations it estimates the average annual energy production of the proposed solar system and the energy value it should represent on a yearly basis. Like Google’s Project Sunroof, it doesn’t work directly with solar installers but directs users a web search for local installers. Each of these offer compelling tools to help you go solar and arms you with valuable information you can bring to the table when talking with installers about going solar. Helping you get the best deal on a solar system, which is a long-term and significant investment. It’s also important to understand that these tools are still limited. Solar installers make onsite visits to physically assess your building for solar and can determine whether a home can use 23 kilowatts of solar panels effectively or in some circumstances, like shading from trees or nearby buildings, or whether the positioning of your roof and its pitches can justify the installation of that much solar power. While the roof could support 23 kilowatts of solar panels, it might just be the case that a solar installer will tell you only half of the roof is positioned to take the most advantage of the sun. In the meantime take advantage of these tools to better prepare for going solar and truly taking control of your energy costs while reducing your environmental impact!